Today marks the 150th anniversary of the birth of David Hilbert. Hilbert was a German mathematician, recognized as one of the most influential mathematicians of the 19th and 20th centuries. Much of his work was not of direct relevance to A-Level mathematics, but his greatness demands a mention in this blog. 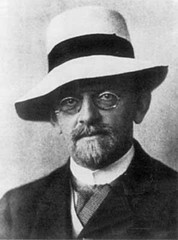 Hilbert worked in many areas of mathematics and developed many fundamental theorems. He also formulated the theory of Hilbert spaces, one of the cornerstones of the emerging "functional analysis". But he is perhaps most famous for his collection of problems that set the course for much of the mathematical research of the 20th century. He presented 10 of these unsolved problems at the Paris conference of the International Congress of Mathematicians, with the complete set of 23 published in 1902 in the Bulletin of the American Mathematical Society. Many of Hilbert's problems remain unsolved, including the famous Riemann hypothesis. Many mathematicians believe the Riemann hypothesis to be unsolvable, at least given the current confines of mathematical knowledge and methodology. But all of the problems generated a vast amount of research and investigation throughout the 20th century. They have led to new mathematical techniques and ideas, which may never have come about were it not for the problems posed. Hilbert's 23 problems at the turn of the 20th century inspired another list of unsolved problems one hundred years later, at the turn of the millennium. The 21st century list of seven Millennium Prize Problems was chosen in 2000 by the Clay Mathematics Institute. Unlike the Hilbert problems, which offered no rewards, the solution of each problem included a million dollar prize. One of the Millennium Prize Problems, the Poincaré conjecture, was solved relatively quickly, with the Russian Grigori Perelman presenting the solution in 2002 and 2003. He famously turned down the prize money and the prestigious Fields Medal that was offered. Hilbert strived to establish rigor in all mathematics and developed important tools used in modern mathematical physics and he is known as one of the founders of proof theory and mathematical logic. Modern mathematics would be in a different, poorer place if it were not for the work of David Hilbert, who would have been 150 today. Sir Francis Galton lived from 16 February 1822 to 17 January 1911. He was a cousin of Charles Darwin, and like many educated Victorian gentlemen, dabbled in many different areas of learning. 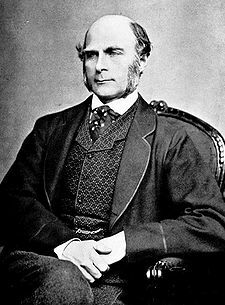 Among Galton's interests were anthropology, genetics including eugenics (the idea of improving the human race by genetic selection), exploration, geography, invention, meteorology and statistics. He was knighted in 1909. He actually invented the term eugenics, and is considered the first person to use the expression "nature versus nurture". Galton's wide range of interests led him to publication of over 340 papers and books during his lifetime. But it is his mathematical contributions, particularly in the field of statistics, that we are interested in. He created the statistical concept of correlation and widely promoted regression towards the mean. He was the first to apply statistical methods to the study of human differences and inheritance of intelligence, and introduced the use of questionnaires and surveys for collecting data on human communities, which he used in his genealogical studies and his analyses of the behaviour of people, anthropometrics. So Galton's contributions were considerable and, in some cases, revolutionary. But some of his ideas were also highly controversial, even for the time in which he lived. He attempted to draw up a 'Beauty Map' of the British Isles, and for this he classified passing girls into three categories: attractive, indifferent and repulsive, surreptitiously making pin-pricks in paper stored in his pocket as a means to build a database. Eugenics itself is today considered a brutal concept. The practices involved in favouring certain families deemed genetically superior was practised by some governments during the early years of the 20th century, resulting in deprivation and a loss of human rights for millions. Galton's book, Hereditary Genius (1869), was one of the first scientific attempts to study genius and greatness. It demonstrates some of the statistical techniques that Galton would develop through his life, but it is steeped in language that is far from acceptable in today's scientific literature, such as "idiots" and "imbeciles". He founded psychometrics (the science of measuring mental faculties) and devised a method for classifying fingerprints that was later used in forensic science. He also conducted research on the power of prayer, concluding it had none, because of the fact that those prayed for lived no longer than those not prayed for. Finally Galton was a pioneer of scientific meteorology. He devised an early weather map, proposed a theory for the formation of anticyclones, and was the first to establish a complete record of short-term climatic phenomena on a European scale. Francis Galton was truly a great British eccentric, whose ideas were often controversial, but whose contributions to statistics and science in general cannot be ignored. Happy birthday to Stephen Hawking, who is 70 today. Hawking will be known to most readers of this blog, an example of an individual whose extremely challenging disabilities have not prevented a life of incredible achievement. He has motor neurone disease, a condition that has progressed over the years and has now left him completely paralysed. Born on 8th January 1942, Hawking is a theoretical physicist and cosmologist, whose scientific books and public appearances have made him an academic celebrity. Among the many awards he has been given throughout his lifetime, he was, in 2009, awarded the Presidential Medal of Freedom, the highest civilian award in the United States. 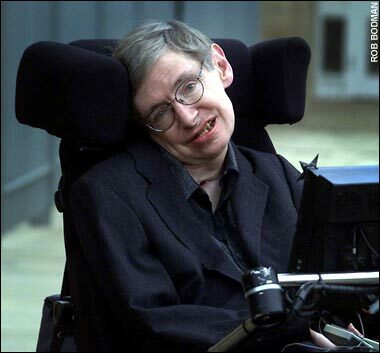 The diagnosis of motor neurone disease came when Hawking was 21, shortly before his first marriage. Forty-nine years later, he has been almost completely paralysed, but is still producing some of his finest work. To speak, Hawking uses a computer fitted into his wheelchair. In latter years, he has operated it using a muscle in his cheek, selecting words, and those words are spoken by a synthesised voice. The voice, familiar to all of us, is no longer available as a speech synthesiser, but Hawking continues to use it because he considers it now to be his own. Hawking was the Lucasian Professor of Mathematics at the University of Cambridge for 30 years. The post has previously been held by Isaac Newton and Charles Babbage, to name just two of the former eminent incumbents. Hawking retired from the post in 2009. In 2007, to celebrate his 65th birthday, Hawking took a zero-gravity flight, during which he experienced weightlessness eight times. He became the first quadriplegic to float in zero-gravity. This was the first time in forty years that he moved freely, without his wheelchair. His plan is to take a sub-orbital space flight in 2013 on Virgin Galactic's space service. Stephen Hawking is now Director of Research at the Centre for Theoretical Cosmology in the Department of Applied Mathematics and Theoretical Physics at the University of Cambridge. He is best known for his contributions in the fields of cosmology and quantum gravity, especially in the context of black holes. Hawking's key scientific works have included theorems regarding gravitational singularities in the framework of general relativity, and the theoretical prediction that black holes should emit radiation, today known as Hawking radiation. He has also written popular science books, in which he discusses cosmology in general, going a long way to making the subject accessible to the general public; A Brief History of Time was by far his best-selling title, staying on the Sunday Times best-sellers list for a record-breaking 237 weeks. At the time of the diagnosis of motor neurone disease in 1963, Hawking's doctors gave his life expectancy as a further two or three years. Everybody who meets the man says he is a highly entertaining person, with a great sense of humour and an ability to inspire. Although he has continued to deteriorate slowly, gradually losing the use of his arms, legs, and voice, and now completely paralysed, Stephen Hawking has lived to celebrate his 70th birthday today. The world of science, indeed the world in general, is a better place because of it.